I started by laying out two circles on the sheet metal that were larger than the finished size. I then cut them out with my band saw, center punched their centers and covered the backs with a single layer of masking tape. I did not overlap the tape, so the tape thickness would be uniform and the disk would be held perfectly flat against the chuck. The tape creates extra friction so the chuck face can turn the work piece without it slipping. I have seen variations of this method where double-sided adhesive tape has been used instead. I know now that I could have turned both disks at the same time by fastening them together with double-sided tape. But I hadn’t done this before, so I decided to play it safe and turn each of the rough disks separately. Turning them was simple and uneventful. I put the blank against the face of my four-jaw chuck, aligned my live center on the center hole I had punched and used just enough pressure so the live center would turn. The disks were close to the maximum diameter that my lathe could handle, so you may notice in the pictures that my lathe bit is not at the optimum angle. I decided to just get the disks round and worry later about getting them the exact size. I was making interrupted cuts because my disks did not come off the bandsaw anywhere near round, so my cuts were shallow and careful. Even so, I did manage to jam one of the disks with the lathe bit. No harm was done because the lathe chuck just slipped harmlessly on the back of the disk, tearing the tape just a little bit. Once both disks were done, I took the smaller of the two and scribed a circle on it that was the final size. I then fastened the big disk to the back of it with double-side tape, remounted them on the lathe and turned them down to the final size. When I was finished I had two identical-sized disks with nicely machined edges. I have heard of a variation of this method. 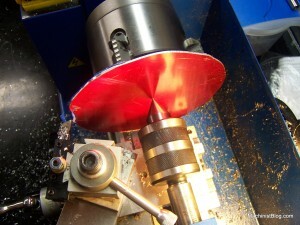 A thick round disk, center drilled to fit the live center, is placed between the center and the work piece. It is useful when you want to put more pressure on the work piece or spread it out over a larger area. It will also allow you to use this method with a work piece that has a hole in the center or if you don’t want to put a mark on the work by center punching it. Hello Jan , I was wondering if you could give me some imformationabout machining a fly wheel like the one on your egg cup sterling . Thanks for the great tip! I’ll try it as I’m starting a project of making a flyfishing reel from scratch. This should be a good way to machine the side plates of the spool and frame. Do you have any tips for the type of cutting tool to use? I’d like to see pictures of your fishing reel when it’s done. So, you’re not familiar with the idea of wax chucks?